Technology & Quality｜Tokuden Co., Ltd.
TOKUDEN has studied customers’ requirements in detail and developed products surpassing required quality and performance levels by employing proprietary technologies accumulated since its foundation. The technological backbone is evidenced by the many industrial properties the company holds. As of 2013 year end, the company had 133 patents in Japan and 41 patents abroad, in addition to 100 patents currently pending. 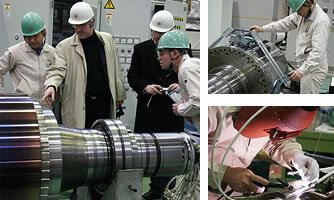 Moreover, TOKUDEN has been leading industry-academia partnerships by engaging in joint research and joint patent application of thermal processing technologies of Jacket Rolls in cooperation with the College of Science and Engineering of Ritsumeikan University and the Graduate School of Science and Technology of Kyoto Institute of Technology. Providing alternating current to an induction coil creates magnetic flux, the effect of which induces an electric current inside the roll shell, creates heat by resistance (induction heating), and warms up the roll shell itself, thus minimizing heat energy loss and enabling highly responsive and highly accurate temperature control. The roll shell incorporates many narrow and thin hollow cavities (Jacket Chambers) in the axial direction, all of which contain a thermal medium in the form of combined liquid and saturated vapor as illustrated below. The thermal medium evaporates by absorbing heat in hot areas and condenses by releasing heat in cool areas. By repeating phase transition (liquid phase and gas phase) in hot and cool areas, the roll shell eliminates differences in temperature (self-compensation) and achieves uniform roll surface temperature with high accuracy. The standard core is made of a multilayer involute core, which has a multilayer structure of formed strips of insulated magnesium steel sheet, and perfectly circular cross-sectional area. Compared with general square multilayer cores, the multilayer involute core has a 12% shorter circumference in cross-sectional area and reduces copper neat loss by 12%. The core periphery is exposed at the edge facing the steel sheet, of which the core structure is suitable for reactors with high leakage of magnetic flux. 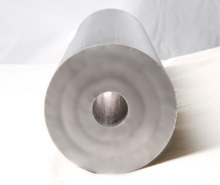 In addition, since it is made of strips of insulated magnesium steel sheet, waste is reduced, thus achieving effective use of resources and reduction of material costs. 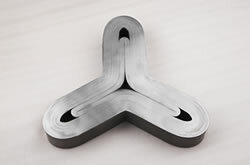 The joint core connecting the leg cores employs a uniquely wound core, enabling creation of a shape that is adaptable to any installation requirements such as triangular or rectangular shapes. 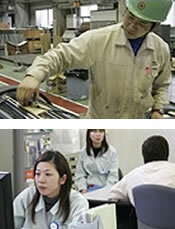 Tokuden's two manufacturing bases are the plant at the headquarters in Kyoto, which produces transformers, reactors and other power supply equipment; and the Makino Plant in Shiga Prefecture, which handles design, production and maintenance of all types of rolls. We have established an integrated system of production from raw material to finished products for each and every product type. Our goal is to deliver superior products that cannot be found anywhere else, and our expert engineers accept the responsibility to create quality at every single stage - from design and development to manufacturing and delivery.